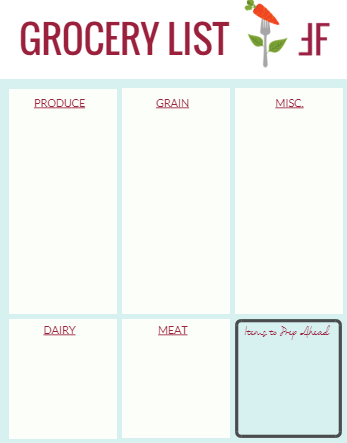 Recently, I've found a need in my life for creating a weekly meal plan. Not anything strict, just something that will save me time in the kitchen, allowing for other activities in my day. First, let me tell you a little about my cooking habits. I really don't love being in the kitchen every day. I mean, REALLY don't love it. There are things to do, people to see, places to go! It's something I enjoy in small amounts. If a meal takes longer than 30 minutes to prep, I'm pretty over it. That being said, I consider myself a "lazy" clean eater. On the other hand, cooking healthy meals is super important to me, as is having enough food prepped and ready so I don't feel the urge to grab Chipotle on the way home from work. C'mon, we all know turning that down is a struggle! Anyone else here in the same boat? Not too long ago, I brought a dietitian into work to give a seminar on how to meal plan for the employees at our company. She broke down some super simple ways to meal plan for the week that wouldn't make you spend more time in the kitchen than you want or have time for. I've always thought it had to be a super-complex task when really, what she was teaching is very do-able for any number of people, including singles and families. This "new" method would allow me to have more free time during the week (which is something we all want, right?! ), and never question what I was having for dinner that night. Once upon a time (aka my whole life leading up to this point) I went to the grocery store every single week. At the grocery store I would purchase the same things week after week. I thought this was efficient because I knew what I liked and could just make different combinations with the same ingredients. No list needed. The result? I would prep a few things on Sunday that would last for about 2 days, and then was left scrambling the rest of the week. What to have for dinner tonight? Hmm.. I didn't factor in any late nights or conflicts so, often times, at the end of the week I was either left with extra food that went to waste, or not enough. Cons - Wasted food, not enough food, scrambling to prepare dinner and lunches each night, time consuming on weeknights. Meal Plan = Life Saver! This isn't the type of meal prep where you cook EVERYTHING on one day and divide it into little Tupperware containers, though this may work for some. It's simply a way to organize your cooking so it aligns with your scheduling needs each week. Plus, it tastes fresher when you can split the cooking into 2-4 days/week, rather than cooking it all on one day (in my opinion). In order to make this as simple as possible, I'm going to break the meal planning process down into 4 EASY STEPS. Yep, that's it! This is where you decide which meals you will need to have prepared and on which days you have time to cook. List any schedule conflict or obligations you have- Do you have any late night meetings, practices, dinner outings? How about early days where a quick breakfast is needed? Or sporting event where a "dinner on the go" is needed? Be realistic on the nights you will eat out. Put that detail into a list that highlights meals for each day of the week - I try to include a snack category on mine too. Below is an snippet taken right from my free Meal Planning Made Easy Guide. Giving yourself the ability to see your whole week at a glance helps with structure. Maybe I only want to cook 3 times this week. I plan to make enough on those 3 days to compensate for the other days. Being prepared is key! Because when life gets busy, our food choices can get out of control. If you have more time to spend and love to cook, your schedule could look totally different from mine! The beauty is that you get to customize it each week to the needs of you and your family. Now, based on your schedule for the week and how many days you are able to cook, count how many actual meals it will take to get you through the week. Include these in your meal plan. I am a creature of habit so I don't mind eating the same thing for 3-4 meals in a row. But for some of you, you may need a little more variety. Mix it up! Or keep it the same like me! After you take your schedule into account, count how many unique recipes you will need and how many servings of each. 3. Find tasty, healthy recipes! Hop on Pinterest or any healthy food blogs to search for good, healthy recipes. Look for recipes that use whole foods and stick to the perimeter of the grocery store (unless it's whole grains, beans, spices, other healthy items). That's just a start. Check out my Pinterest boards at Fit-Foundations for more ideas! Last but not least, write down all of the ingredients you will need in order to prepare these meals for the week. Try to organize them into categories and in the order you shop. I start in produce, make my way to meats/proteins, then grains and dairy to finish. This makes for a much quicker shopping trip! Subtract any items you already have on hand. Consider portion sizes and doubling any recipes for which you'd like to have leftovers. BOOM. DONE! Go get your shopping on. If you're seeking nutritional advice on how to fill your plate with the right food, My Plate is a great resource! Filling your plate with healthy, whole ingredients is the most important part to success in nutrition. Second, is crafting the plan that will guide you through your week so you can stress less about food and have a backup plan when life gets busy. Making this process as easy as possible will help you stick it out and form. that. habit. You never know what extra ingredients are loaded into your quick take-out, even if it's tagged at being "under 500 calories." I hope you were able to take away some keys to efficiently meal plan for yourself, significant other or family! How many people do you have to cook for? Have you tried meal planning before? Any other methods besides this that have worked for you? Connect with me and the rest of the community on Facebook and Instagram (@fit.foundations) for extra inspiration on fitting fitness and health into your life!